Insurance firm Allstate is expanding its offerings in the field of consumer protection plans by acquiring repair outfit iCracked, a purchase that could allow customers of its plans to more easily repair their iPhones and iPads, and could also give the company more sway in pushing for right-to-repair legislation in the United States. The acquisition, confirmed on Tuesday, has the San Francisco-based iCracked joining SquareTrade, an Allstate subsidiary that focuses on consumer plans and tech support. The terms of the acquisition were not revealed by either company. iCracked is one of the biggest independent repair chains in the United States, with operations providing repairs in more than 60 metropolitan areas across the United States and Canada. While an explanation for the deal doesn't explain directly why, it is likely that Allstate will use iCracked to speed up the claims process for device repairs, potentially reducing the time customers spend without a phone from days to just hours. "Today's consumers rely on connectivity to run their lives, and they can't afford to wait for device repairs," said Ahmed Khaishgi, President and co-founder of SquareTrade. "With our recent acquisition of iCracked, SquareTrade is uniquely positioned to protect the hardware and software that power our customers' connected devices." At the same time as bolstering its consumer offerings, acquiring iCracked also makes Allstate a major force in the right to repair movement in the United States, due to its business involving third-party repairs. Repair.org executive director Gay Gordon-Byrne confirmed to Motherboard the outfit has already loaned a lobbyist to assist the push for legislation in New Hampshire. The purchase is already being seen as a positive for the movement, with iFixit CEO Kyle Wiens claiming "I'm optimistic that this partnership will elevate the visibility of the work that we're doing together." The right to repair movement aims to make it easier for device owners to fix issues with their products or to take them to third-party repair centers, rather than being forced to replace them or to send them off to the manufacturer for servicing. In a number of states, right to repair bills have been proposed to force manufacturers into making it easier for others to acquire spare parts and relevant information to allow a repair to take place. Apple has long been a target of the movement, due to the overall difficulty in repairing iPhones and its other products, as well as its tendency to point consumers towards its own repair process via Apple Stores, while simultaneously making it hard for third-party vendors to make their own repairs. For example, in October the company came under fire for diagnostic software related to the T2 security chip effectively blocking some third-party repairs of the 2018 MacBook Pro and iMac Pro. Reports over the years have also attacked Apple for its repair policies, but in some cases the arguments are presented without an understanding of how the Apple repair system works as a whole. I am an Apple shareholder but am not a fan of sealed up devices designed to be thrown away instead of repaired. Not exactly a fan of insurance companies, but Apple's wrapping itself in a green patina while designing devices to be throwaways is more than a little hypocritical. Right to repair should be a no-brainer. A thousand Dollar cell phone should not be a throwaway device you replace every 2 years. Maybe 10 years ago, but the technology is mature. 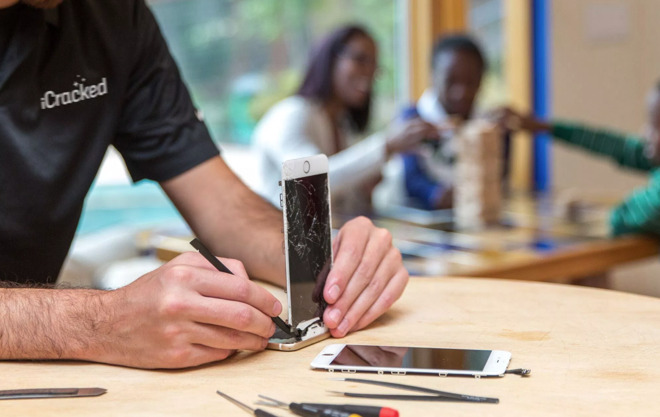 Some, but not all, of these unregistered repair shops serve as a way to place parts from locked and stolen iPhones back into revenue streams. Funny how these guys put themselves up as fighting for the little guy when they just want to make money by doing repairs or charging 20 bucks for a set of tools which cost them 2 bucks. There’s nothing honest about their intentions, they just want to expand their revenue streams. Competition is always good for consumers. Looking forward to when I get to choose who repairs my idevice, including myself should I choose to. Ewaste is a serious issue. Just because Apple is done with my device after 5 years doesn't mean I am. Are you thinking of iFixit? Right, iPhones are simply thrown in the garbage and are piling up in landfills. NOT. I got $100 for my iPhone 6 when I bought the iPhone 8. Did Apple throw that iPhone 6 in the garbage? I tell you a story what happened in my company. A year ago, the HDMI port on one of my MacbookPros was broken. I brought the machine to the official Apple repair center in my neighborhood for a repair. The dealer repaired the MBP but made a administrative error with the invoice which I only discovered 6 weeks later when I had to send the quarterly VAT declaration for my company to the tax administration. While acknowledging he made a mistake, the dealer refused to correct his error, explaining that 6 weeks was too long for administrative fixes. This refusal costed my company about 70 Euro. In no way I want to go back to that dealer if a new repair for any Apple device is needed. The next official repair center is too remote to be practical. The only reasonable thing is to go to an unofficial repair center, which happens to be just around the corner and which has a much better customer support service than the official Apple repair center. That was an embarrassingly bad post. I would like to see a blend - apple invites third parties to work in their store with real apple parts. The advantage? Easy, I won't have to sit at the *&#^@_ apple store for hours to be seen. Love my apple products, but I hate having them serviced. My iPhone 6 got a crack and I threw it away. Apple is the only phone company who gives a sh** about the environment. Try switching to the knockoffs who people replace every 6 months. Talk about that waste! Apparently Apple supporting your device for 5 years isn't enough. Literally the new meme against Apple from the haters is "Apple products last too long." Apple already has a network of Authorized Service Provider partners in place. The main proponents of these right to repair bills are organizations and individuals who do not want to become partners with Apple or adhere to Apple's service standards and requirements. They basically want Apple to be forced to fully support these opportunists who want all of the benefits afforded to partners without having to invest any of their own time or money in becoming an authorized service provider. This is pretty much the status quo for the Entitlement Culture that pervades modern society - they want every single one of the benefits that paid membership provides but they don't want to pay for it. The sad thing is that some (perhaps most in some channels) of the authentic service parts that are being funneled into these channels are coming from parted-out Apple products that were iCloud locked, either because they were stolen (illicit sources) or they were returned to carriers in a locked state after the mandatory service period and sold at auction (legitimate sources). One way around this would be to require iPhones to be manufactured from standard replaceable components designed around standardized interfaces. Google started down this path but gave up. This approach would seriously throttle innovation and slow technological progress to a snail's pace. This approach may work in some societies where governments want to get involved in yet another area they cannot serve well. In a highly competitive market where the biggest rewards go to those who build the most compelling and attractive products it would be a total disaster. If a lack of serviceability or excessive total cost of ownership (TCO) of Apple's products have a negative impact on Apple's customers, it is Apple who should suffer the consequences of their own decisions with declining sales. Having the government get involved in (non safety and non regulatory) product decisions and business matters of companies who live or die based on how they conduct themselves and service their customers is the absolute last thing consumers should ever want. We want the best and we want companies to earn our business. The government is perfect for managing concerns that have no business value or dealing with things that would otherwise never get done. Other than that, just about everything government sticks their fingers into turns to crap. The government needs to keep their dumpster fires out of Apple's lane and let Apple succeed or fail based on their own merits. I suppose it wouldn’t be a big deal for Apple to buy a stake in this repair chain so they’d have the benefit of controlling both consumer pathways. Apple doesn’t just “point customers to its own repair facilities”, which would be fine. Apple refuses to repair any device that was once touched by a third party facility. So say your 1 year old iPhone is out of warranty, and the battery goes down. You have it replaced for $29 on the spot instead of paying $89 and waiting around for Apple to repair it. Say 9 months later you drop it, and the TouchID button is busted, and you go to Apple to have it repaired. They do a self test, notice it’s not an Apple battery, and they refuse service, regardless of how much you’re willing to pay. Your phone is ready for the trash can. Same goes for MacBooks: they refuse to accept them for repairs, no matter what’s broken, if you dared to replace a broken battery. Bahhhh I feel so sorry for you sheep with your psuedo-computers.